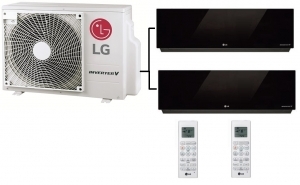 With these LG Artcool Mirror multi systems one outdoor unit runs a number of indoor units to give you greater installation flexibility. These systems are very popular in residential applications due to their stunning look. This model outdoor unit is the LG MU4R25.U40 which uses the latest R32 refrigerant. Among the features of these systems is a quiet mode - one press of a button and the indoor fan unit runs at a barely audible 20dB. Another unique feature of the LG systems is the Gold Fin anti corrosion coating to the outdoor unit. This ensures the outdoor unit heat exchanger performs to optimum level and is far less affected by outside corrosion influences such as salt corrosion. As an added bonus the artcool mirror indoor units have built in wi-fi.